It is customary to make beans, legumes or lentils regularly in my home. After all we follow a largely vegetarian diet and these are excellent sources of protein. Chole (chickpeas curry), Rajma (kidneybeans curry) and Kala chana masala (black gram curry) are made almost every week along with paneer (cottage cheese) recipes. When I make these, I normally serve them with both rotis and rice or sometimes only rice. These are super delicious and really tasty. There is another dry black chana recipe that is mostly make for prasad or on festivals that is also very tasty. Another quick recipe is that of black chana soup. Black chana is very flavourful when cooked and bursting with nutrition. Apparently it is fed to the horses. 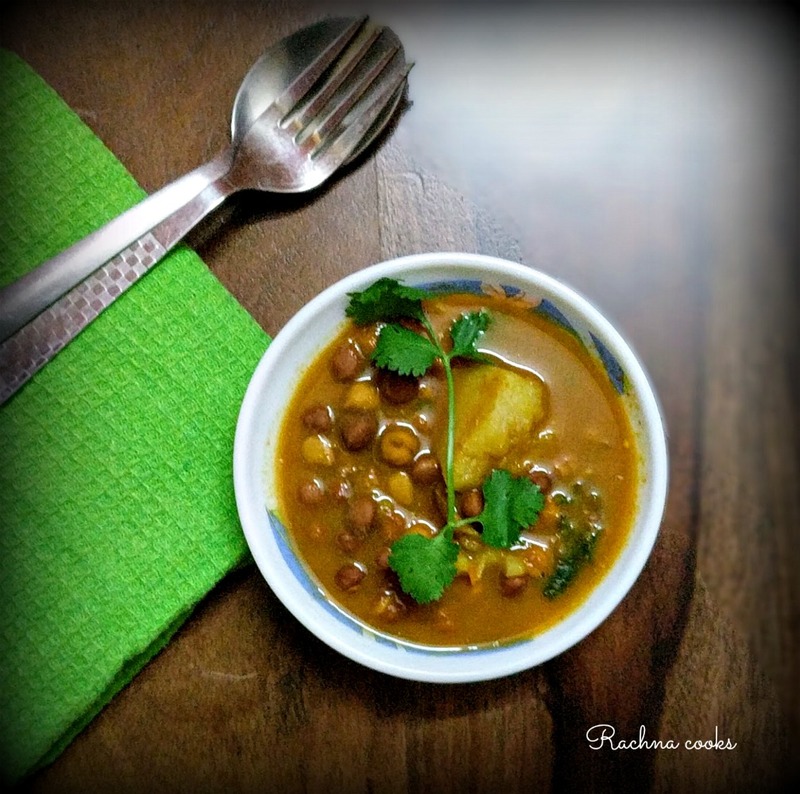 So here is the easy kala chana gravy recipe. 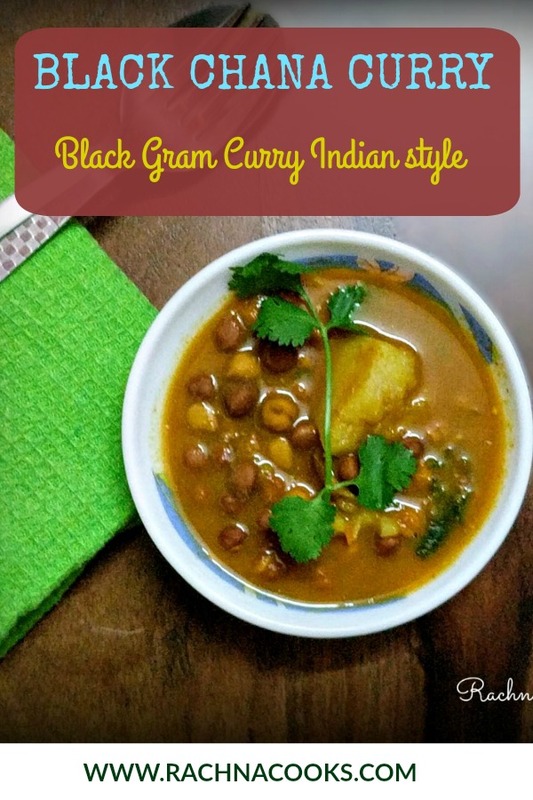 This black chana curry is a delicious high protein recipe that is perfect for vegetarians. Goes very well with rotis, parathas, pooris or rice. Do try it. Soak the black chana overnight. Cook in a pressure cooker with cubed potatoes and black salt. Add enough water to cover the chana and potatoes. Cook till chana are well cooked and potatoes are slightly mushy. Now in a kadhai heat oil or ghee. Add cumin seeds and let them sputter. Add chopped onion and fry for about 4-5 minutes on low heat. Now add ginger-garlic paste and fry till the raw smell goes away. Now add the tomatoes with green chillies (as per taste) and saute for another 8-10 minutes. Cool and blend this paste. Now in the same pan pour this masala paste. Add boiled chana with potatoes and about 1-2 cups of water for the gravy. Add in the spice powders -- turmeric, garam masala, coriander, amchur, cumin and chilli powder (optional). Taste and adjust salt. Cook covered for 8-10 minutes till the gravy incorporates all the flavours. Garnish with chopped coriander leaves and serve punjabi black chana masala gravy with rice and rotis. Potatoes make the gravy a bit creamy. This gravy is slightly runny and goes very well with both rice and rotis/puris. Black chana must be well cooked but not mushy or breaking apart. 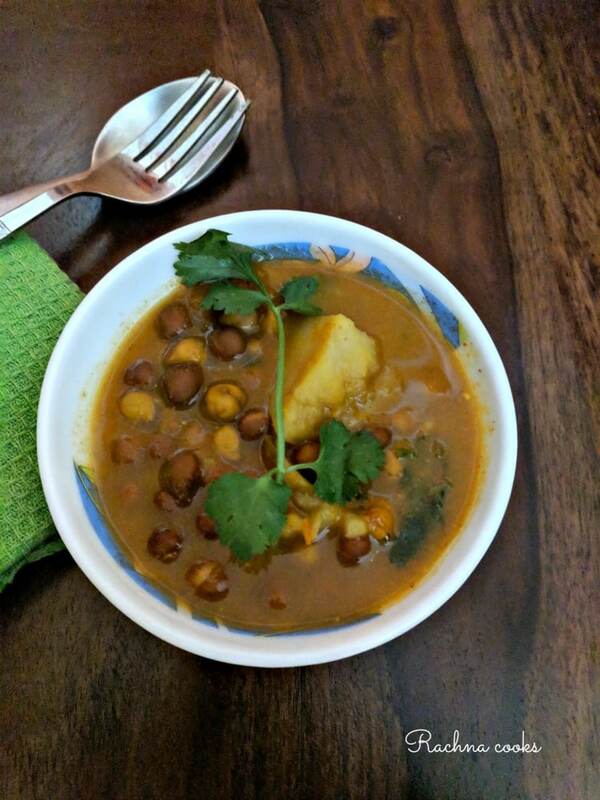 This was an easy kala chana curry recipe. Hope you try it at home. It is good to pack along for office lunch or in lunchbox for kids. Do let me know if you try the recipe. Black chana is one of my faves! This looks so delicious!